I’ve had a bit of fascination with metal necked guitars since reading an article about them in the guitar magazines I collected in the 90′s. It was years before I actually got to play one, as there was none floating around the small country town where I grew up, funnily enough. While we had an abundance of Strats and Les Pauls, but you wouldn’t exactly expect to see the local wedding band guitarist strumming away on a 70′s aluminium necked Kramer in rural New South Wales. 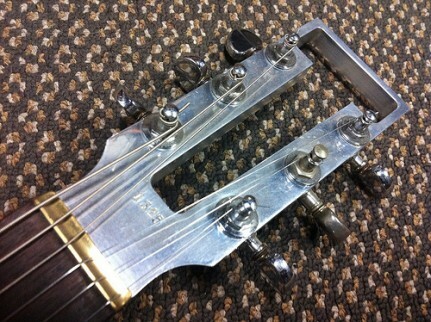 When I moved to Brisbane, I got to know Tim from Tym Guitars and he also had a fascination with metal necked guitars. Being Tim, because he couldn’t find a Travis Bean, he just built his own version. Tim’s necks are cast and are quite heavy. 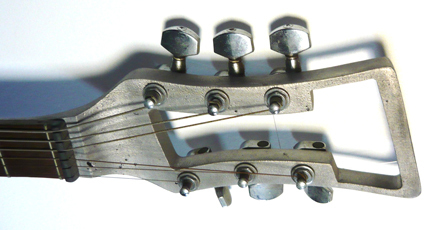 They’re solid as a rock and being Tim… have a very thin Mosrite feel. I borrowed one of Tim’s metal necked beasts to muck around with and it was pretty damn fun. And heavy. Did I mention it was heavy? A few years ago, Tim tracked down a Travis Bean that had been slightly modified (possible refinished) with a that price was very tempting, so he snapped it up. It has since entered Tym Guitars hire section, so you can rent this beast for that special occasion where you have to unleash your inner Steve Albini. The only Travis beans I’ve played are this one and another that was for sale on consignment in Tym’s shop a few years ago. As a player, this is the pick of the two but the other one was much lighter. This is kind of Les Paul Custom weight territory here. 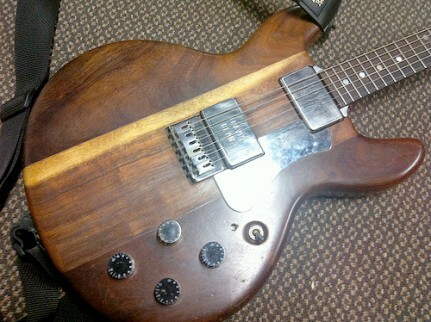 Which isn’t surprising with this much metal shoved into a guitar. 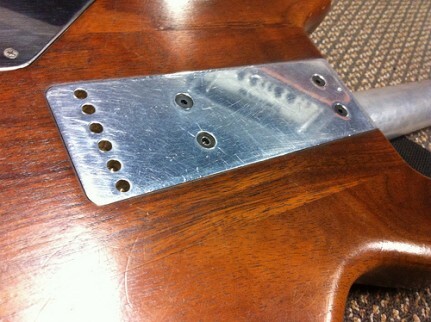 Here’s a closeup of the neck insert. As you can see it goes down to below the bridge, and the guitar body kinds of ‘slips’ on. This guitar really does feel solid as a rock. 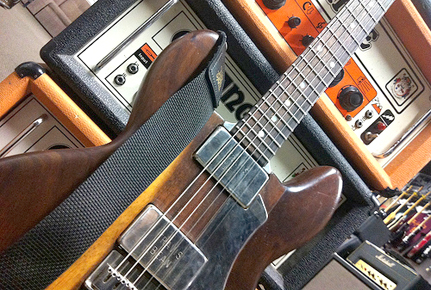 The neck is really comfortable… a little wide and pretty thin. The fretboard is also pretty flat, but notes don’t choke out or anything. 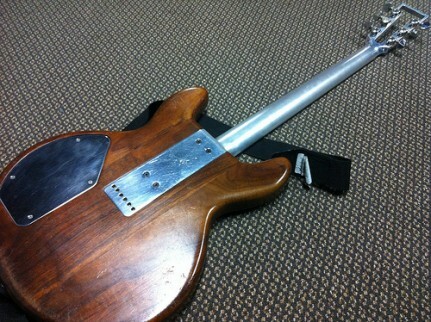 The neck has a really smooth finished and feels really slick to the touch. People complain about these necks feeling cold and a little unnatural, but with a neck that plays and looks this good, who cares. 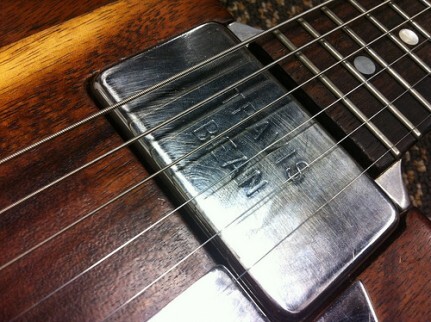 The pickups are the standard Travis Beans and sound pretty bright. As this guitar was tuned to C#, I was trying to play some dooooooom riffs on it, but due to the sound I kept on doing my ‘Rocket From The Crypt’ type rock riffs. It is a bright sounding guitar as a whole, and the notes are very articulate. You can really hear what you’re doing, so for the sparkly Hot Snakes type arpeggio stuff, this would suit. The body is pretty cool looking, with some interesting markings. 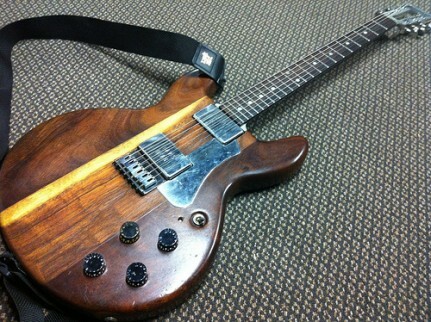 A Travis Bean expert contacted Tim and said that due to the bright area on the upper body and the grain not matching, it’s probably refinished as Travis Bean wouldn’t release a guitar that looked like that. I actually really like it… it breaks up the brown. There’s too many brown guitars out there. And they’re very brown. Strapped on, this guitar hangs pretty well. I’m not sure I could handle a whole gig with something this heavy. That’s why I’ve been kind of avoiding my Les Paul’s in the last year or two… I’m starting to have a few problems with my left shoulder from gigging so much with heavy guitars over the years. So lately I’ve played my G&L’s and Maton’s and my shoulder feels a lot better. It doesn’t help that I have the body of a 12 year old boy… and a scrawny one at that. But yeah, I could handle at least 6 songs with this before my collar bone snaps. And it would be worth it. 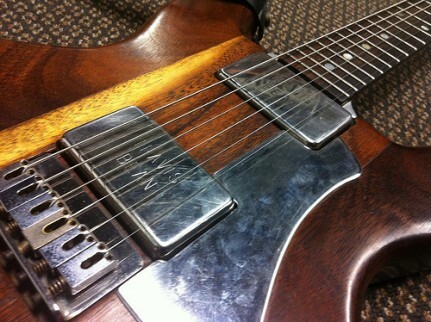 These days, these guitars are worth SERIOUS money. They’re reaching the $4,000 to $5,000 range, which is way out of my league. But there are other options to get your metal neck fix. 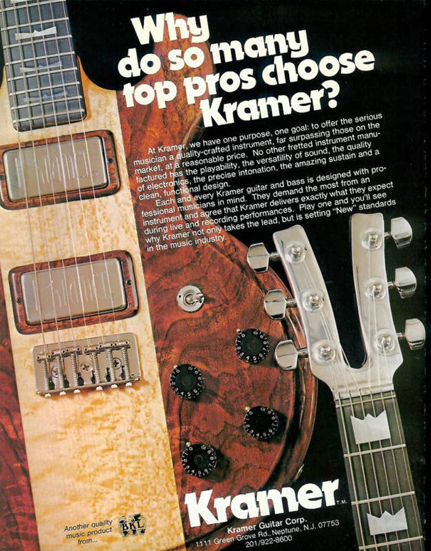 70′s Kramer guitars are very similar to these Travis Beans, as Gary Kramer worked with Travis Bean before leaving to start his own company. You can certainly see the similarities in the guitars. 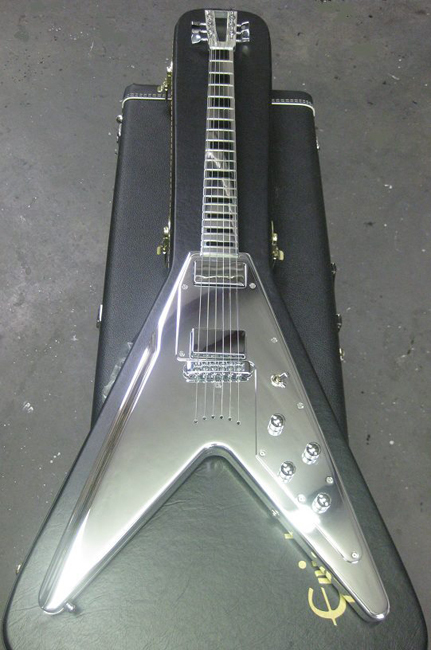 And the various metal necked Kramer models can be picked up from $400 to $2,000. A new company that is doing great stuff is Electric Guitar Company. The owner is a massive Travis Bean fan and has really done great work in carrying on the tradition. He has even gone a step further with making the fretboard metal as well… which looks spectacular.And his prices are amazing… around $2,500. Thanks to Tym Guitar’s for letting me play his Travis Bean. Now… onto Shellac’s Brisbane show in October!!! Great article Tony! When I saw the photos on your Flickr profile I was expecting a story on Tym’s TB any day. These are fantastic guitars, I have TB1000s #937 and it is the best guitar I have ever owned, I’ve also got an EGC on oree which should be done really soon, it will be cool to compare the two. Wow mark, a yellow wedge! That’s crazy, one of only 30 or so ever made! I’d love an artist or 500 one day, the artist is attainable the 500 maybe not. Do you have photos of your collection anywhere? I’m having the collection photographed in the near future. It also incldes a Veleno, Zemaitis, Hamiltone, Original Senn, Burns Flyte (the one in Paul Day’s book) just to name a few. Keep up the great work with this site. Its one of the best going around. Whoops, should’ve tuned that back up Tony. You’re gonna get me in trouble.